We are looking for teachers who can demonstrate effective and ongoing teaching success. Our search is for people with a talent that will provide the next generation with an outstanding practitioner; individuals who generously and tirelessly inspire and enhance the learning experience and care passionately about the future of embroidery. The prize pool is £1,000 to help inspire the winners to take their practice and teaching to an even higher level. Two awards are available. One is open to those teaching in a Further or Higher Education institution in UK or Ireland. The other is for those involved in an established teaching practice in adult and community education. The criteria for both awards are the same. Applications for the 2016 Award are now open. The final deadline is Friday 22nd January 2016. Teachers may nominate themselves, or a peer or student may initiate an application. For further information of the award and the full application pack are from the the Embroiderers’ Guild website :- here. Applications will be judged on the basis of evidence offered in response to the Award Criteria and referee statements. The Trust were delighted to attend the Cathedral of the Forest Flower Festival in July. The church looked radiant with beautiful creative arrangements reflecting the designs of the Beryl Dean and Sylvia Green embroideries – sadly the images here do not do them full justice. The lecture by the conservator Wendy Toulson was really excellent – not only describing in technical detail the work she undertook to conserve the various pieces but also placing Beryl’s wider work in context using illustrations of historic works, many of them local, which she had encountered in her work. We hope to share the full lecture on the website in due course. It was touching to see the appreciation given to the textiles which adorn this ancient church and we are hugely impressed by the commitment and hard work that went into raising funds and sourcing professional expertise to ensure that, despite their inherent propensity to decay, they continue to fulfil their purpose in the best possible condition. 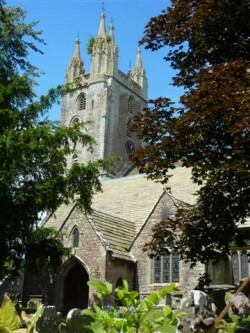 12th-13th July 2014 at All Saints Church Newland (The Cathedral of the Forest) Gloucestershire, a Flower Festival “A Celebration of Textile Design”. Beryl and her long time friend and colleague Sylvia Green completed a commission for All Saints in the early 1980’s and the PCC have recently funded conservation work on some pieces. In celebration of its completion the flower arrangements will be based upon the Beryl Dean works and the conservator, Wendy Toulson will give a talk, ‘Beryl Dean – Conserving her Work’ on Saturday 12th at 2.30pm in the church. The Beryl Dean website went live on Monday 7th April following the prestigious Beryl Dean Education Award event held at St. Paul’s Cathedral (see previous news item). The website, initiated by Beryl Dean’s godson David Dawson Taylor and completed by Jake Farr and Tamsin Gale, will ultimately contain much of the Beryl Dean Archive. Holder of the Archive, The Beryl Dean Education Trust, aims to create a learning space where teachers and students of embroidery can connect with important historic approaches to design and technique. Beryl was skilled at taking the essence of excellence in past traditions and reinterpreting it in a modern idiom. It gave her work a richness that enabled it to stand the test of time. Her learning, creativity and perceptions have much to offer to contemporary embroiderers in their efforts to create work of lasting value and significance. Currently on the site you will find a timeline for significant events in Beryl’s life and work, the beginnings of an image catalogue of her works and information on Beryl’s books. The long list of exhibitions featuring her work is underway. Future plans include offering ideas and techniques from the books, possibly by videolink/podcast. The Trust is very keen to hear from anyone who has memories of Beryl or her classes to add to and enliven the Archive. Please do also contact us on mail@beryldean.org.uk to share ideas for improving the content of the site. The inaugural Beryl Dean Award presentation took place at a prestigious reception at St. Paul’s Cathedral on Monday 7th April, hosted by Gyles Brandreth. In the presence of HRH Duchess of Gloucester, patron of the Embroiderers’ Guild, and over 80 leaders and practitioners in Textile Art, Professor Malcolm Lochhead, Chair of the Judging Panel, presented the four shortlisted nominees and announced Karen Nicol the winner. Opening the event, Gyles Brandreth, a cousin of Beryl Dean, referred to Beryl’s passion for art, her skills in stitch and her talent for passing on both to others. The strength of her vision for the future of Church embroidery enabled her to innovate and her work remains a shining example of the highest standards. He thanked the Dean of St Paul’s for offering the Crypt for the event, and also for the special display of two major works by Beryl Dean and her students gifted to the Collection of St Paul’s, the Hammersmith Cope (1968) and the Jubilee Cope (1977), worn by the Bishop of London at the Queen’s Silver, Gold and Diamond Jubilee services. 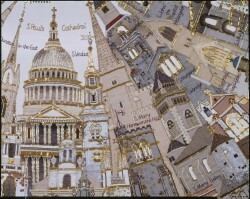 Christine Poole, Chairman of the Embroiderers’ Guild said that the Guild intends that the Award will encourage excellence in the development of both design and technique in embroidery and foster relationships that will maintain and improve infrastructure in embroidery education. The Award will run for ten years. Professor Malcolm Lochhead, textile artist and Millennium Fellow in Design at Glasgow Caledonian University, who chaired the Judging Panel paid tribute to the quality of the thirteen applicants and the special talents of each of those shortlisted. Winner Karen Nicol, well recognised for high quality craftsmanship in embroidery and textile art, both in the UK and internationally, as well as extensive teaching and mentoring said that she was honoured to receive the award and that she is strongly committed through her teaching to maintain the critical skill of embroidery in the 21st century, exploring sculptural forms and working with new materials. Catriona Charlton, Embroiderers’ Guild “Young Embroiderers” Ambassador, winner of the 2014 De Denne Competition, then presented HRH Duchess of Gloucester with her winning piece as a gift of thanks, to mark the 40th Anniversary of YE, a division of the Guild for students up to age 24. Closing, Gyles Brandreth said the energy, enthusiasm and creativity so apparent in this occasion were inspirational and boded well for the future of embroidery. That so many representatives of the craft’s institutions and makers had gathered spoke of the continuing interest and value attached to the promotion of arts and crafts and he wished the Award well for the future. The winner of the Beryl Dean Award for Teaching Excellence in Embroidery and design in Textile Art was announced at the AGM of The Embroiderers’ Guild on Saturday 5th April. A formal presentation of the award is to take place in an invited audience on Monday 7th April at St. Paul’s Cathedral, Crypt; the venue for two major exhibitions organised by Beryl Dean in 1968 and 1990. © The Beryl Dean Education Trust 2019.